1. In a bowl, whisk together pomegranate juice, grapefruit zest, vinegar, sugar, and ¼ cup of grapeseed oil. Whisk together until sugar dissolves and set aside. 2. In a large sauté pan set to medium-high heat, add grapeseed oil, shallots, garlic, and green beans. Sauté for 3-4 minutes until green beans soften but are still crisp. Remove from heat. 3. In a large bowl, toss green bean sautee with pomegranate vinaigrette. 4. In a large serving platter, arrange all green beans, garnish with grapefruit and orange segments, TAJÍN® and pomegranate seeds. 1. In a blender, add chopped pineapple. Cover and blend on high speed 1 minute until smooth. Strain pineapple puree into measuring cup. Measure out 1 cup pineapple juice and add to medium saucepan. 2. Separately, blend chopped watermelon, and blend on high speed for 1 minute until smooth. Strain into a measuring cup and measure 1 cup of watermelon juice. Add to a separate saucepan. 3. To each saucepan, add ¼ cup sugar and ¾ cup water. Bring to boil over medium-high heat; cook 1 minute, stirring to dissolve sugar. Remove from heat. Stir in 1 teaspoon TAJÍN® to each saucepan when cool. 4. Strain mixture into 8-inch baking dish. Cover and freeze at least 8 hours. 5. When ready to serve, scrape mixture with fork until fluffy. 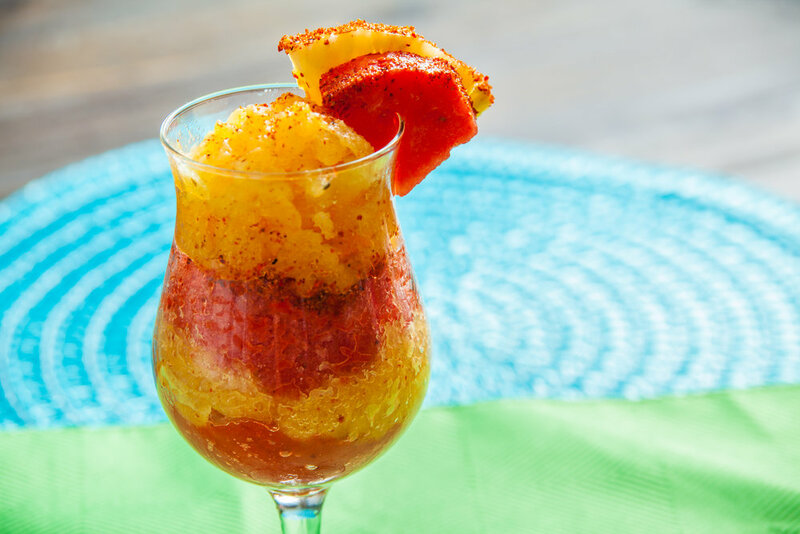 Serve by layering 1 inch layers of Pineapple Granita and sprinkling with Additional TAJÍN®, followed by Watermelon Granita, sprinkling with TAJÍN® and repeating until glass is full. Serve immediately. 1. In a large bowl, put in Chicken, Corn, Avocado, and Cilantro. Mix to distribute evenly. 2. Add Yogurt, Mayo, Lime Juice and Spices. Mix until well incorporated and well coated. 3. Serve by making sandwiches on whole wheat bread and cutting into shapes for kids lunch boxes. Pair with cubed Mango and Pineapple sprinkled with TAJÍN®. 1. Set a vegetable steamer on medium-high heat and add enough water to cover the bottom of the pan. Add broccoli florets to basket. Steam for 6-8 minutes or until fork tender. Remove broccoli from steamer and place into a food processor. 2. Add the chickpeas, cilantro, garlic, lemon zest and juice, tahini paste, olive oil, and TAJÍN®. Pulse 4-6 times to break up larger items and then blend together until well combined and smooth. Check for salt and season to taste. 3. To serve, place hummus in a serving dish and drizzle more olive oil and sprinkle with an additional helping of TAJÍN®! 1. Take a spoon and remove the flesh from the avocado skins. Place the flesh into a blender along with all of the can of coconut milk (include cream). Add the granulated sugar and lemon juice to the blender. 2. Blend until smooth. Using a rubber spatula remove the contents and place into a large bowl. Fold in lemon zest and TAJÍN® seasoning. Making sure to incorporate well. 3. Place mixture into an ice cream maker. Allow to freeze according to the manufacturer’s instructions. 4. Remove from ice cream maker and serve or store in refrigerator for later use. 1. Fill a large stock-pot with hot water and add salt. Set stock-pot on high heat until a rolling boil is achieved. Add Cauliflower Florets and boil for 3-4 minutes until fork tender. Strain and allow to cool completely. 2. Dice cauliflower florets into small bite size pieces or desired size. Place cauliflower into a large bowl and add both lime and orange juice. Season with TAJÍN® and salt to taste. 3. Fold in Tomatoes, Cucumber, Onion, and Cilantro. Mix until thoroughly incorporated. 4. Cover bowl with plastic wrap and place in refrigerator for 30 minutes. 5. 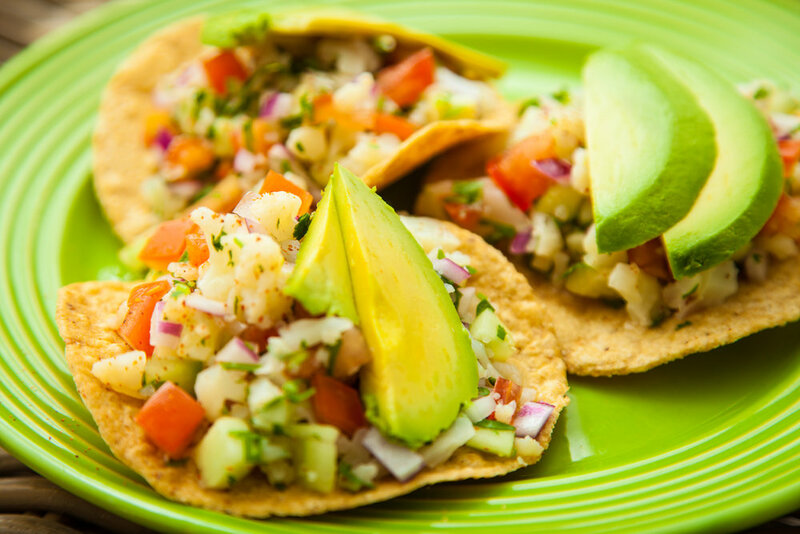 Serve with tostadas, saltine crackers, and garnish with avocado slices. 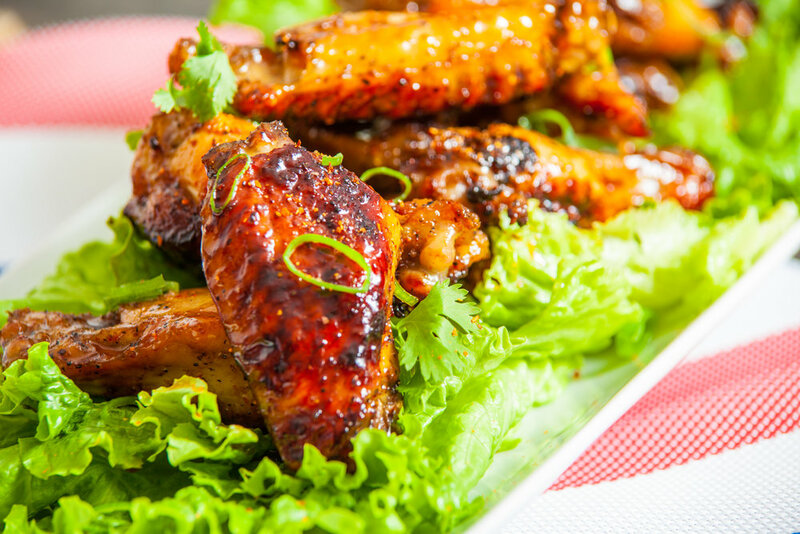 In a large bowl, toss chicken wings with vegetable oil and season with Tajín and black pepper. Place on a baking sheet and Broil with the rack about 5 inches away from the broiler. Broil the wings until the skin starts to crisp and brown, about 12 minutes. Flip the wings over and broil the other side until crisp and golden brown, about 8 minutes. Meanwhile, in a large bowl, whisk together the glaze ingredients until smooth. Check wings for doneness and remove from oven when cooked through. Toss the wings in the sauce bowl until well coated, return to the baking sheet and broil until the glaze turns shiny and the skin has crispy charred spots, about 1 to 3 minutes. Watch carefully. To plate, place wings in a serving platter and sprinkle the scallion greens and cilantro on top of the wings. Serve while warm. In a bowl, place all vinaigrette ingredients and whisk together. Using a 2” ring cutter, cut watermelon slices into 24 rounds. Place all slices into a gallon size zip bag and incorporate vinaigrette and allow to marinade in a refrigerator for 15-20 minutes. Remove watermelon rounds from bag and pour out marinade into a large bowl. Whisk in ¼ cup of oil. Add arugula and toss to coat in vinaigrette. Create stacks by layering stack with one layer of watermelon, one orange slice, two cucumber slices, and arugula. On a floured surface, roll out pizza dough to an 10-inch round. Transfer dough to a parchment-lined baking sheet. In a small bowl, whisk egg and brush pizza dough with egg. Sprinkle with granulated sugar. Bake until lightly golden, about 12-15 minutes or based on your packaged instructions. Meanwhile, using a stand or hand mixer, beat yogurt, cream cheese, and powdered sugar on low until incorporated. Increase speed on mixer to high and whisk until aerated and whipped. In a separate bowl whisk together apricot glaze and microwave for 15 seconds on high. Remove carefully and set aside to cool. When cool whisk in TAJÍN® seasoning. Remove pizza dough from oven and cool. To assemble, add yogurt cream cheese whipping to pizza dough leaving a ½ inch edge. Add sliced fruit to your liking. 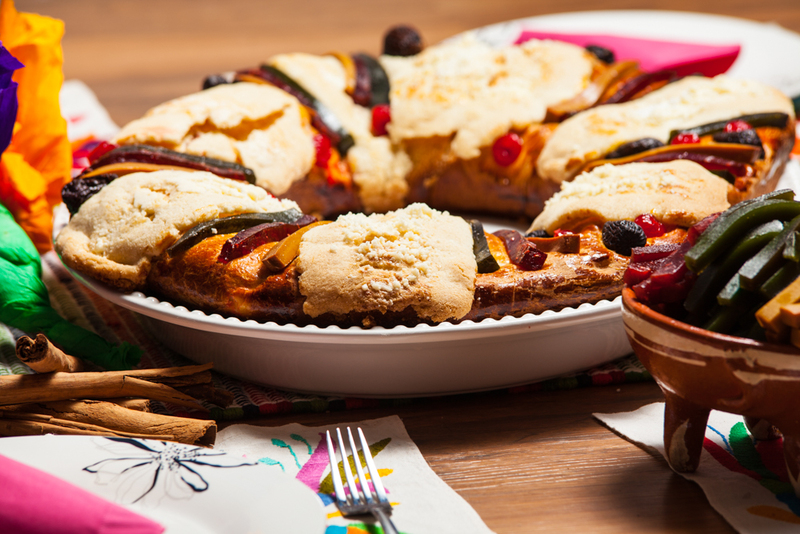 Glaze fruit with Apricot TAJÍN® glaze to make shiny and delicious. Sprinkle with extra TAJÍN® for extra kick. Slice and serve! Preheat outdoor grill or grill pan to Medium-High heat. In a large zip lock plastic bag, combine the marinade ingredients and sirloin cubes. Seal with little air left in bag and toss gently to coat. Refrigerate for at least 1 hour or overnight, turning occasionally. Thread beef onto six metal or soaked wooden skewers. Discard marinade. Thread Veggies onto six metal or soaked wooden skewers. Sprinkle all with TAJÍN® generously. Using long-handled tongs, moisten a paper towel with cooking oil and lightly coat the grill rack or grill pan. Do not saturate paper towel with too much oil. Grill steak and veggie skewers over medium-hot heat for 8-10 minutes or until beef reaches desired doneness. Use a thermometer to check beef temperature: 130° for medium rare, 145° for medium, 160° for well-done. Remove skewers from grill and allow beef skewers to rest for 2-5 minutes.